- 【All-day Activity Tracking】 With walking, running, swimming, cycling, football, basketball, badminton 7 sports mode. Accurately track all-day activities including steps, distance, calories burned, sleep status and heart rate with comprehensive analysis. - 【Multifunction】 Remote photo, find phone, alarm clock, sedentary remind, take medicine remind and so on. Get call, SMS and SNS messages from Facebook, Twitter, WhatsApp, and other Apps at a glance. 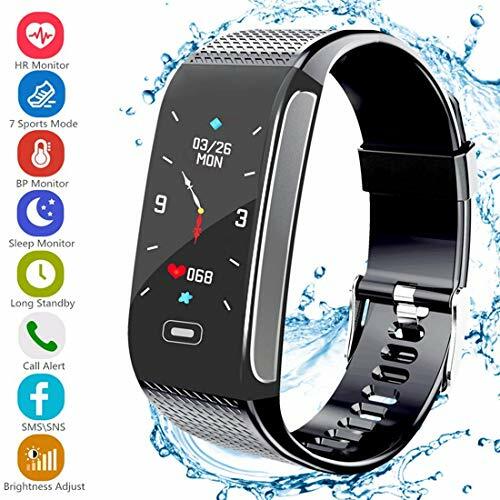 - 【Upgraded Version】 Designed with 85mAh battery, energy-efficient chips, brightness adjustable color IPS display, IP67 waterproof, longer working time, easy to view all kinds of information whether indoor or outdoor. - 【Wider Compatibility】 Compatible with android 4.4 or higher, iOS 8.2 or higher smartphones (not for tablet or PC), please install WearHealth App on your phone and pair the device from it. - 【Interchangeable Bands】 With interchangeable bands, give you more choices and pleasure when using, band length is adjustable between 5.7 to 8 inches, fits most men, women, boys and girls.